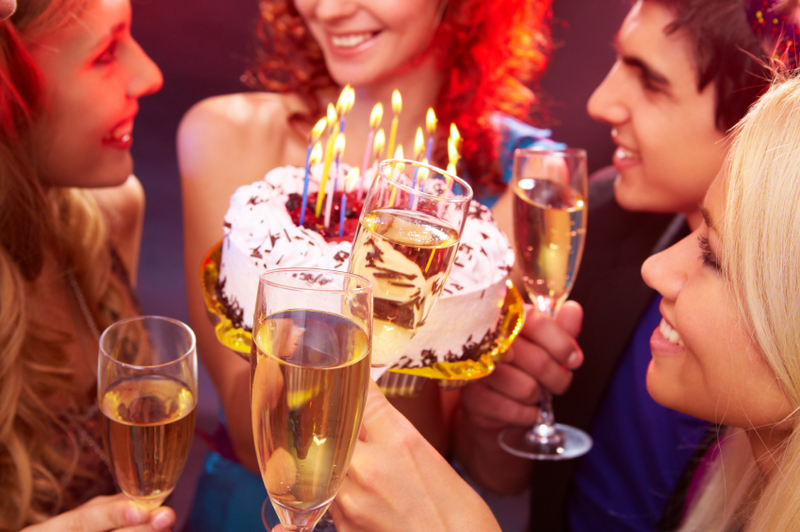 Check out these teenage birthday party ideas for some fun ways to celebrate with your friends. ---- It's important to base any teen birthday party on the personality and interests of the guest of honor. If the birthday girl enjoys hair and makeup, then she may have fun with a spa night. The video game addict might be miserable at a dance party, but would love a few hours at the arcade. Know your teen and pick a theme and activities he or she will appreciate. A pool party or a day at the beach is a great way to celebrate a birthday for those born in the summer months or who live in warm climates. Pair the water fun with a cookout or a late-night bonfire. A photo scavenger hunt is a unique activity among teenage birthday party ideas. Before the party, create a list of items that must be photographed. They can be very specific, such as "the road sign at the corner of 5th and Main" or open to interpretation, like "something beautiful". Then create small groups of partygoers and set them lose with a digital camera or cell phone camera. Give the groups a time limit and award prizes to the group that captures the most items on the list. Whether it stays in the background or provides an excuse to get up and dance, great music is essential to a great party. Music can also be the focus of party activities. Guests can channel their inner stars with a karaoke machine. Musical fans might want to watch their favorite movie musical. Some teenage birthday party ideas are highly traditional. For instance, the quinceañera is a coming-of-age ceremony in many Latino cultures that recognizes a teen's fifteenth birthday as her entry into adulthood. There is an associated religious ceremony and many symbolic gestures, such as giving the birthday girl her last doll to represent the end of childish things. Sweet Sixteen parties don't have the same religious sentiment and symbolism behind them, but have been around for decades and can just as elaborately mark this turning point. If your teen is crafty, plan a party focused on creativity. In your home, guests can make friendship bracelets, create beaded jewelry or knit a small accessory. See if a local pottery studio or ceramics studio can accommodate a party. Check with a small art gallery for a behind-the-scenes tour or group painting lesson. Many teens' lives revolve around the social scene. No matter what kind of cake you serve, what activities you plan or what decorations you use, if the guest of honor can spend time with his or her favorite friends, the event is sure to be a success. ---- Check out more teenager party activities before you plan your next birthday party.